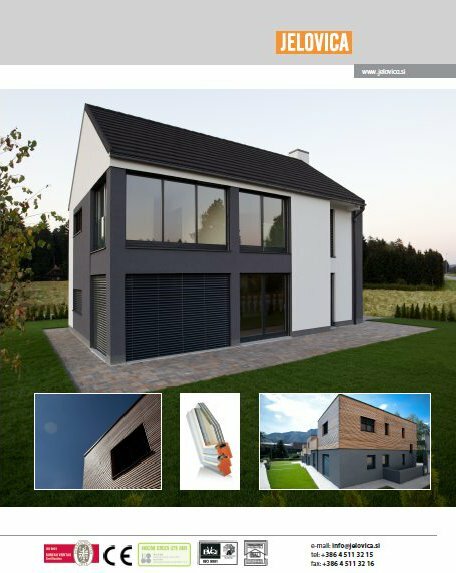 Jelovica Group boasts a 100-year tradition and is considered the leading Slovenian manufacturer of houses, windows and doors. With its 55 years of tradition in designing and creating energy efficient prefabricated houses, Jelovica is one of the European pioneers in the field of energy conserving construction. So far, the company, which exports most of its production, has built more than 12,000 low energy consumption buildings in 26 countries worldwide, which places it among the largest European companies in the sector. The company is proud of its modern technology, which is compliant with demanding Slovenian and international standards and uses quality natural materials to build houses. Jelovica offers its customers a completely individual approach to architectural solutions. In 2010, the company introduced a completely new concept for houses called Revolution, which represents a revolutionary approach to modern methods of choosing a new home. are met. The wooden windows provide excellent thermal insulation and thus, besides conserving energy, co-create conditions for healthy living. Wood is a natural material whose main advantages over other materials are excellent thermal insulation, balancing humidity in the rooms, low energy consumption during wood processing and ecological acceptability. The company's range of windows on the market can satisfy the requirements of every client. Besides wooden windows, the company also provides wooden windows in combination with aluminium and PVC. Each window is a combination of modern design and revolutionary technological solutions that respect tradition. 55 years of tradition in constructing lowenergy facilities made of wood make up the firm pillar of Jelovica’s knowledge, experience and design. In the real estate sector, Jelovica enjoys the trust of clients across the globe. Jelovica has constructed a number of energy-saving kindergartens and other multi-dwelling buildings in Slovenia and abroad.